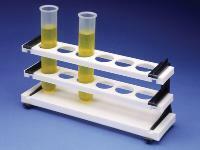 White polypropylene rack has six places, each 27mm in diameter, to hold 50mL tubes. Top to bottom deck height is 10cm (4") with the flat bottom deck providing a reflective surface for tubes. Steam autoclavable. Racks snap together for easy assembly.